Happy New Year to all our customers! If you are planning your wedding for 2015 and are looking for a place to start then why not read our stationery guide to help you decide upon the perfect announcement for your wedding day and the perfect wedding stationery for your wedding breakfast. From the save the date card or wedding invitation to the wedding breakfast stationery and thank you cards – your wedding stationery sets the scene and tone for your wedding day. The wedding invitation is usually the first impression your guests will receive about your special day. So where should you start? As with all of your wedding planning decisions, your budget will to a large extent determine the quality and extent of your wedding stationery. Once ypou have decided upon a budget you can plan for the type of stationery you would like to annouce your wedding day. A entirely unique design may appeal to you but you need to know that you can afford the costs of a bespoke designer! To a large extent the type of printing can contribute to the cost of your stationery. Letterpress, foil printing and gilt edging add a luxurious feel to your wedding invites but can be a little more expensive than digitally printed designs. WHAT STATIONERY DO I NEED? Save the date cards are sent out up to one year in advance of your wedding and are a great way of making sure that guests keep you date free. Save the Dates are an especially good idea if you are getting married at busy holiday times like summer or Christmas/New year or particularly popular days like Valentine’s Day. If you are getting married abroad or inviting overseas guests, save the date cards will help your guests plantravel arrangements and holtel bookings in advance. The save the date cards are usually smaller than the main invitation and have only basic information such as the names of the bride and groom – and of course the wedding day – but ideally they would be of a similar style as the main invitation that is to follow. The main wedding day invitations are sent by the hosts to invite guests to both the wedding ceremony and the evening reception. The hosts are traditionally the bride’s parents but many couples are now host their own weddings and so the invitation may well come from the couple getting married. 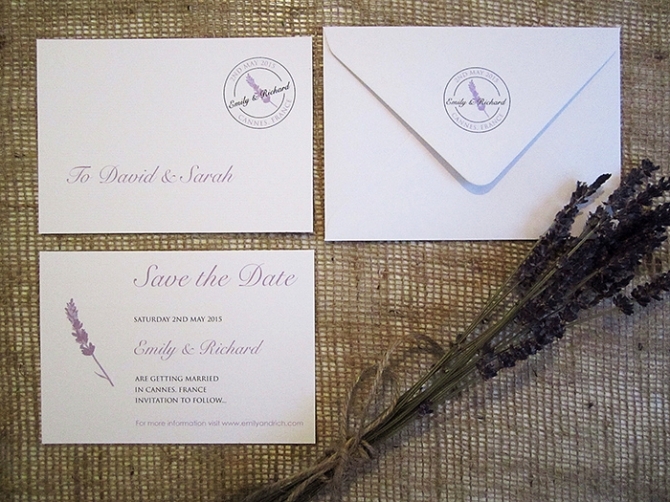 Invitations are typically sent out two to four months in advance of the wedding date to make sure everyone has plenty of time to reply and organise travel and accommodation if necessary. If many of your guests are travelling from abroad, or you are getting married during the busy periods of the year, it may be better to either send the invitations out earlier or consider sending a save the date card. 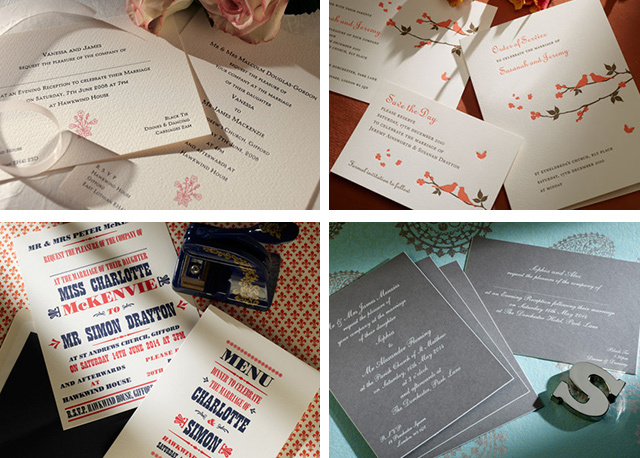 Letterpress wedding invitations have a wonderful, tactile feel and add a touch of elegance to any wedding stationery suite. Evening invitations are sent out to the guests that you would like to invite to the evening celebration only (and perhaps the wedding ceremony too). Perhaps you want to have a small number of guests to your wedding breakfast but have a large number of family and friends that you would like to invite to help to celebrate after the reception. Evening invitations should ideally be of a similar style to the day invitations but can often be a simpler design allowing you to reduce costs. An RSVP card with reply address already printed is often included inside the invitation so that your guests can reply easily and quickly. You may include menu options on the RSVP or request information about any dietary requirements that your guests may have. Many people now ask for song choices! Not everyone sends out an RSVP. If you have a wedding website this information is often included on the main invitation with a facility to respond by email. It’s often very useful to include information cards with your wedding invitations with additional information that my help your guests. This could be and the address of your ceremony and reception venues along with directions and even a map. Or it could include local accommodation ideas or your wedding gift list, whatever information you think will help your guests to spend the perfect wedding day with you. If you have a large amount of additional information that you wish to include in your invitation you may wish to consider pocketfold or wallet-style invitations which are perfect for including a lot of guest information cards in one convenient place. Order of service cards or mass booklets are handed out to guests at a church service or religious ceremony to help them follow the service and join in with hymns etc. The order of service is a folded card, oftern with paper inserts, giving details of the wedding service or mass such as readings, hymns, vows and music. The front of the card traditionally has the name of the bride and groom along with the name of the church or venue and the wedding date and time. The layout of the order of service will depend upon the style of the service – your priest or minister should be able to give you advice. It is usual to provide one card or booklet per guest and don’t forget to include a copy for the minister. Order of the day cards are usually much simpler than a full order of service booklet and are given to guests at any type of ceremony. They provide the guests with an itinerary of the day’s events and timings. A guest book for guests to sign and write their own personal message to the bride and groom, provides a wonderful reminder of all the guests who have celebrated your special day with you. Look back for years at the private messages from friends and family and bring back lasting memories of your wedding day. If you are having a seated wedding breakfast reception, a table seating plan is usually displayed at the entrance to the dinning area and is a great way to ensure that all your guests find their seats easily. The seating plan itself can be as simple or elaborate as you wish but it would usually carry the same theme as the rest of the wedding breakfast stationery. A large, framed table plan can actually be a decoration in it’s own right. There are lots of unusual ways to direct your guests to their seats and they can make for a fun element to the dining occasion. A menu card is a courtesy to your guests so that they know what it is that they will be eating during the wedding breakfast. Individual cards placed on a napkin or on the guest wedding plate will add a lovely element to your wedding breakfast table decorations. Guest place name cards and table names or numbers are essential if you have a seating plan to allow your guests to see which table they will be seated at and their individual seat. Again, these give a great opportunity to add wonderful decorative detail to the wedding breakfast table. Wedding favour boxes or bags are traditionally positioned at guest place settings and are perfect for adding decoration to the wedding breakfast table as well as making lovely gifts for your guests. Favours are traditionally filled with sugared almonds but many different favours are available now – why not break with tradition and place a lottery ticket or other gift in place of the favour box. It’s really up to you! It is common courtesy to thank all of your guests for attending the celebrations and for their gifts. Cards printed with a photo of the wedding can provide a wonderful memento for your quests and if you have moved house you can use the opportunity to send your new address and contact details to all your friends and family. I hope this guide to the main wedding stationery elements will help you when choosing the right stationery suite that reflects your own unique wedding style. 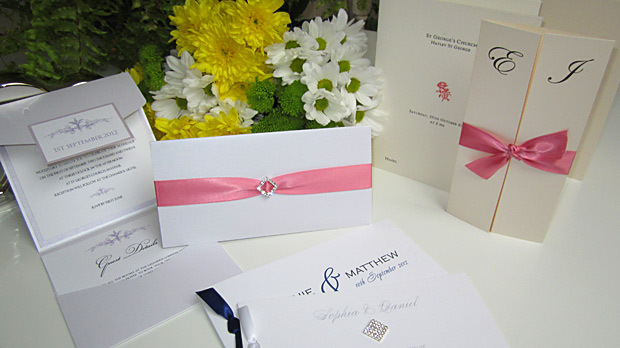 We are available to help you with any aspect of your stationery planning. If you are looking for unique ideas or need help with wording your invitations or order of service do not hesitate to contact us! We are here to help guide you through the stationery maze. Happy wedding planning for 2015!